Moscow -- In his annual end-of-year news conference, Russian President Vladimir Putin warned about the growing threat of nuclear war. 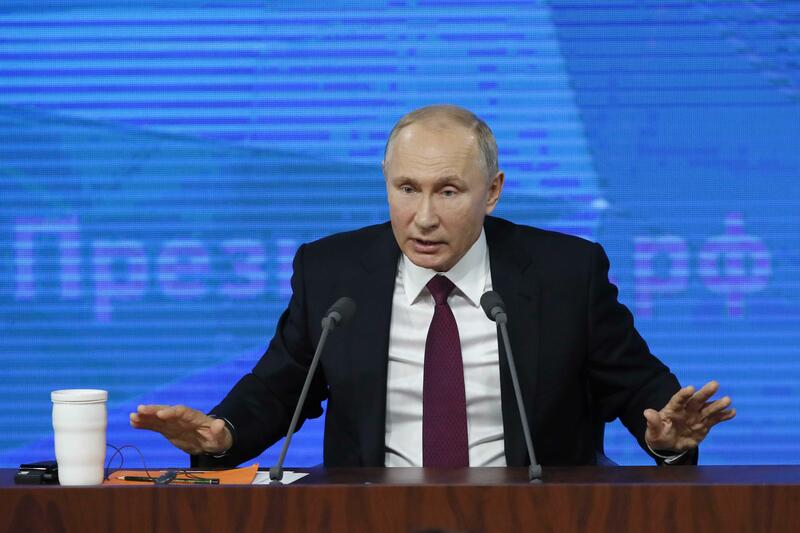 "The danger of the situation escalating is being downplayed," Putin told a crowd of hundreds of journalists in Moscow Thursday. "If something like this would happen, it might lead to the collapse of the entire civilization." Earlier this year, U.S. President Donald Trump stated his intention to withdraw the United States from the Intermediate-range Nuclear Forces treaty (INF), a Cold War-era nuclear arms treaty that has kept nuclear weapons out of Europe for 30 years. "I believe that humanity would have the necessary common sense in order to avoid any extremities," Putin said, noting that if the U.S. were to put intermediate range missiles in Europe, Russia would take countermeasures. "I do generally agree with the president of the United States," Putin told journalists Thursday, welcoming Mr. Trump's decision to withdraw American troops from Syria. He said some "major advances" had been made against terrorist groups there, including the Islamic State of Iraq and Syria (ISIS). He did, however, indicate some skepticism as to whether Mr. Trump would actually deliver on his plan. "American forces have been present in Afghanistan for some 17 years, and every year they talk about withdrawing... but they're still present there," Putin said. The Russian president restated his long-held position that U.S. military involvement in Syria is illegitimate, because it wasn't approved by the Syrian government of Bashar al-Assad or sanctioned by the United Nations Security Council. "We do not see any signs of the American withdrawal from Syria," Putin said. "But we see that it is possible." "I don't know what she can confess," Putin said of Maria Butina, who is currently detained in the United States after pleading guilty to acting as a covert agent for the Russian government. Butina, a Russian citizen, was charged with trying to infiltrate conservative political groups in the U.S.
"She has not been acting under any guidance or any (direction) from the Russian authorities," Putin continued, suggesting that she may have entered her guilty plea because of threats or intimidation. Putin said, however, that the Russian state was "not indifferent to her future. We will support her as far as we can." Putin faced the media during a massive annual press conference for which a reported 1702 journalists were accredited. In past years, the marathon conference ran for over four hours and has been known for its pageantry. Though members of the international press do attend, the majority of questions are usually asked by local journalists from around Russia. Competing with one another for attention, they wave bright signs in order to get called on. This year, attendees were asked to restrict the size of their posters so as not to block television cameras. Russia's media has been categorized as "Not free" by the group Freedom House. Ahead of this year's conference, Kremlin spokesman Dmitry Peskov said in a televised interview that, "If somebody tries to dispute the fact that there is freedom of speech in Russia, I am ready to argue with them forever," according to the Russian state news agency, TASS.